It’s not often that you can enjoy great barbecue and benefit a community organization at the same time. That’s what the third annual ‘Cue for a Cause barbecue competition and family fun festival delivers. Money raised will benefit the Elmhurst Walk-In Assistance Network. Admission to the Sunday, September 3 event is free, and there’s something that everyone in the family will enjoy. Come for lunch, dinner or both, as the event is from noon to 8 p.m. All of us at Elmhurst Toyota look forward to sampling the delicious smoked fare at ‘Cue for a Cause this Labor Day weekend. You can watch teams of competitors barbecue chicken and ribs as they vie for cash prizes and all the bragging rights that come with being named the Grand Champion. Taste delectable homemade barbecue sauce and vote for the People’s Choice award based on taste, aroma and appearance. Enjoy authentic pit-roasted barbecue and other American comfort food from Barbeque Jim’s Catering, washed down with beer, wine, or your favorite non-alcoholic beverages. There will be raffles for great prizes, including Sox, Cubs, Hawks and Bears tickets, live music, a rib-eating contest, and a children’s play area with inflatables, a magic show, face painting, balloons and other fun activities. The Elmhurst Walk-In Assistance Network (formerly known as Elmhurst Walk-In Ministry) has been helping families and individuals in the community since 1997. Among other services, they offer emergency assistance in paying for housing, utility bills and prescriptions, access to local food pantries, vouchers for food, clothing, and gas, and one-time-only car repair. Sunday, September 3, noon to 8 p.m.
‘Cue for a Cause is free to attend. Purchase of food, beverages and raffle tickets is available. 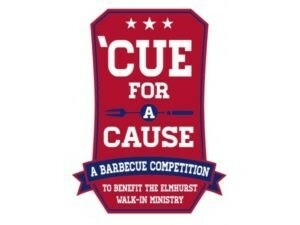 For more information on ‘Cue for a Cause, visit ewanet.org/Barbecue. For more information about Elmhurst Walk-In Assistance network, call 630-782-6006 or email walkin97@ewanet.org.